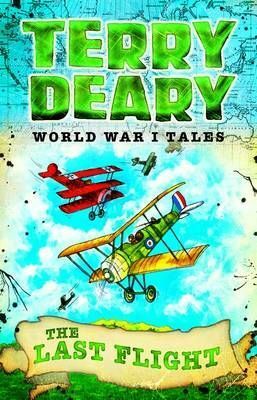 Stories of the First World War from the bestselling Terry Deary, author of the hugely successful Horrible Histories. France 1917 - the war in the air. An air observer is shot down behind enemy lines and meets the German flying ace, the famous Red Baron. Photographer Alfred Adams was born 1 June 1896 and became an observer in WW1, taking pictures over enemy lines. He was shot down by the famous 'Red Baron' Manfred von Richthofen over France along with his pilot Donald Stewart on 5 April 1917. They landed across enemy lines and both survived as prisoners of war. The tale tells how Alfred ended up spending his 21st birthday in a German prisoner of war camp, where he was visited by the Red Baron himself. The master historical storyteller gives readers aged 7+ a fascinating look at the First World War in the air, from both sides.